Alkynes treated with sodium in ammonia are reduced to trans alkenes. Alternatively, potassium in ammonia can also be used. STEP 1. 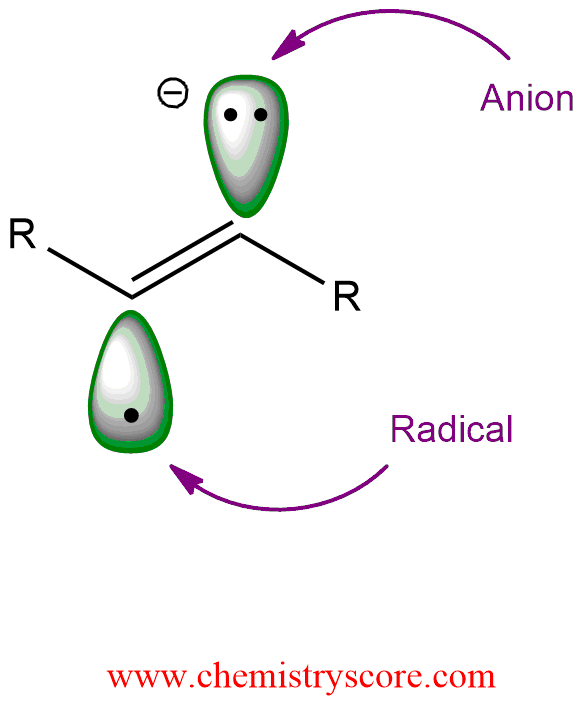 A single electron is transferred from the sodium atom to the alkyne, generating an intermediate that is called a radical anion. STEP 4. Ammonia donated a proton to the anion generating a trans alkene which is stable to further reduction. As we can see, the mechanism is comprised of the following four steps: 1) electron transfer, 2) proton transfer, 3) electron transfer, and 4) proton transfer. This is, the net addition of the molecular hydrogen is achieved via the installation of two electrons and two protons in the following order: e–, H+, e–, H+. The trans stereochemistry of the final alkene is set in the first two steps of the mechanism. Under the reaction conditions (liquid NH3, -33°C), the second one-electron transfer takes place faster than cis-trans equilibration of the radical. This type of reduction typically provides >98% stereochemically pure trans alkene.